Hi there, hope you had a wonderful 4th of July weekend! I am here today sharing a card with this week's Cheery Lynn Designs challenge theme "In stitches". My card is using a few dies that have the appearance of stitches or you can actually stitch them as the holes are there for you to put thread through. To create my card I die cut two of the largest French Flair - Scalloped LG Stackers Nesting Dies out of kraft card stock. 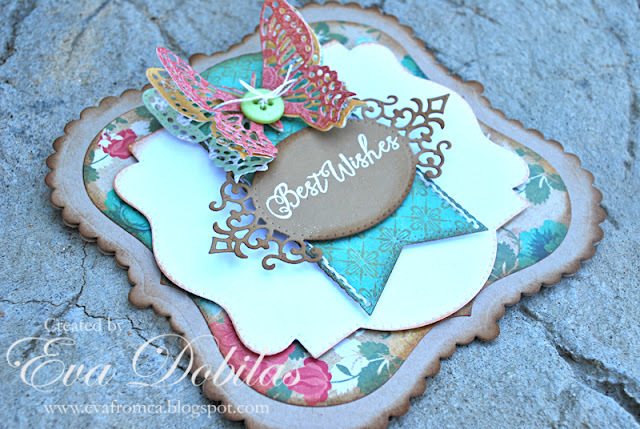 Than I die cut a smaller size French Flair Classic LG Stackers Nesting Dies using patterned paper. Than I die cut the largest Pierced Stackers #3 using white card stock and I layered all of them on top of each other. I than die cut one of the Pierced Stackers #3 using patterned paper and stitched through the holes using white thread. I die cut Royal Scandinavian Tag 1 using kraft card stock and I white embossed my sentiment. Finally I die cut three Small Exotic Butterflies #1 out of three different color patterned papers and glued them together and put a button int he middle and added it to my banner.